The Department of English is hosting the Illinois English Expo on August 25, 2016 from 3:30-5 in the Mary Kay Peer Lounge, which is located in the basement of the English Building! We’ll be there with print copies of the journal! There will be free pizza and drinks for everyone at the event. We hope to see you there! 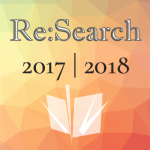 If you have any questions about Re:Search, please email uiuclitjournal@gmail.com or Marilyn MacNamara (macnama2@illinois.edu) with any questions. We hope to see you there!